Sheen, shimmer, shine! 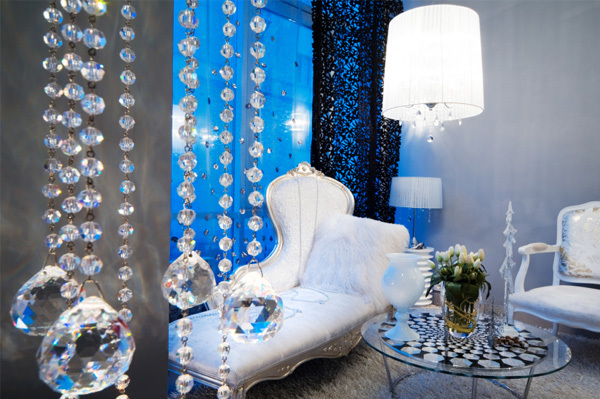 Touches of sparkle can glam up your space. Get some tips on how to add this luxe look! In the same way we’ve seen metallics light up fashion runways, interiors are taking a turn toward sparkle. You don’t have to go for all-out glitz that clashes with the practicality of your lifestyle, but using a touch of shimmer and shine enlives a room and adds some luxe. A few accessories can change the feel of any room! Yes, you can combine metals — gold, silver and pewter — with pretty results! Pewter has a matte finish that is complementary to traditional decors, but brings a subtle sheen. Gold says luxury, and silver works in a variety of decors. Compliment what you have by selecting accents with the right silhouette — clean and modern pieces for contemporary rooms, more embellished for romantic spaces. Don’t be afraid to make combinations that please your individual preference: mix crystal with glass and metals, or silver with interesting pieces in silvered or coloured mercury glass. A grouping of mixed candlesticks on a sideboard covered by a mirrored topper doubles the shimmer when candles are lit, reflecting back into the space. Mixing different finishes with similar styling makes a collection more eclectic and gives it a “collected-over-time” look. Add candles to a spring fireplace to turn a dark space to a focal point. Replace a lamp with one featuring a silver, gold or crystal base and a simple shade, or hang a metal medallion or art piece above the mantel. Mirrored walls are so passe, but not so a pretty mirror in a metal frame. Find one right-sized for the room and hang it on the fireplace, on a wall facing a window, or resting against a wall to reflect a long slice of light back into the room. Top a table with a mirror and arrange a pretty metal or crystal vase filled with spring blooms on it, along with a favourite family photo in a beautiful silver frame. It’s not a huge commitment to toss a few sequined pillows onto your couch for just a touch of sparkle. If you’re feeling bolder, add more shimmer with a throw in a woven metallic fabric, or look for new drapes in silk or with luxurious embroidery. Play with side tables or accent chairs to add real pop to existing furniture. A mirrored side table or chest will add immediate impact. Furniture pieces painted gunmetal gray are subtle, but carry the metal theme in a complementary fasion. Anchor the room with an area rug in silver, or attach a row of metallic tiles to a wall for some gleam that double-duties as art. Move slowly, adding single pieces until you get the right balance of sparkle in your space.